Bhagawan says that everything in this world is ephemeral. Therefore, it is meaningless to depend on something that is itself changing all the time. Our basis must always be unchanging. The only unchanging aspect in our life is the love of God. 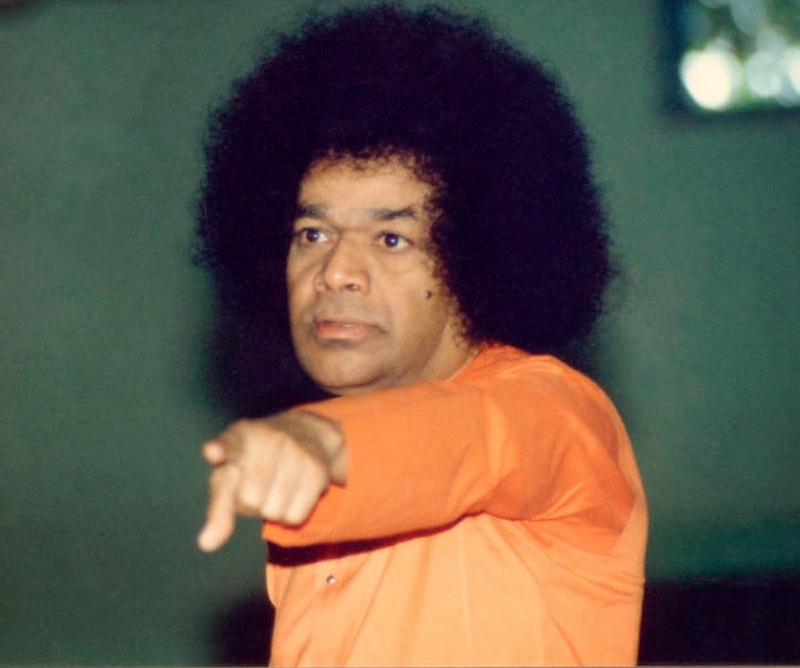 Love of God, Bhagawan says, is truth and is eternal. But how do we cultivate love for God. There are five requisites that Bhagawan gives us as virtues to be cultivated before we can develop love for God. These are the 5Ds - Dedication, Devotion, Discipline, Discrimination and Determination. 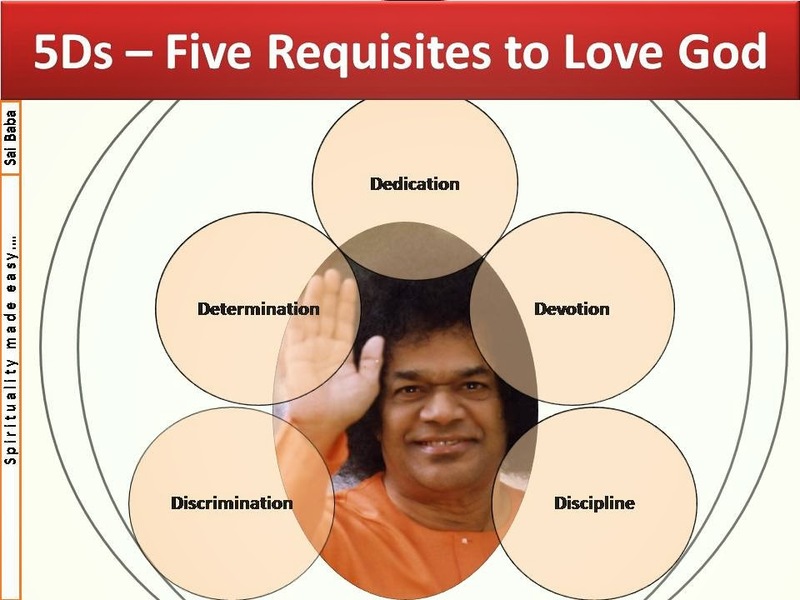 In this post, Bhagawan elaborates on these five requisites that we need to cultivate so that we may develop love for God. 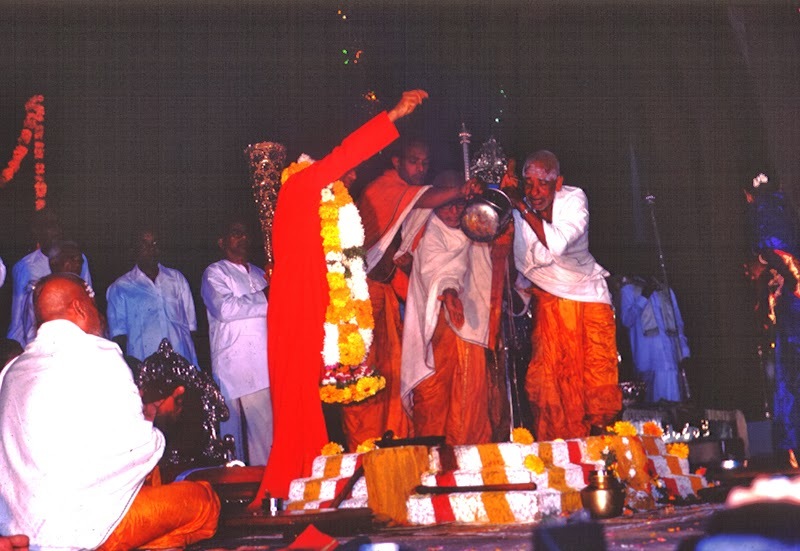 There are five audio excerpts in this posting taken from the Divine Discoure delivered by Bhagawan on the 17th of February 1989. Clip-1 explains that the primary thing we need to dedicate to God is our ego, which stands as an obstacle between us and God. 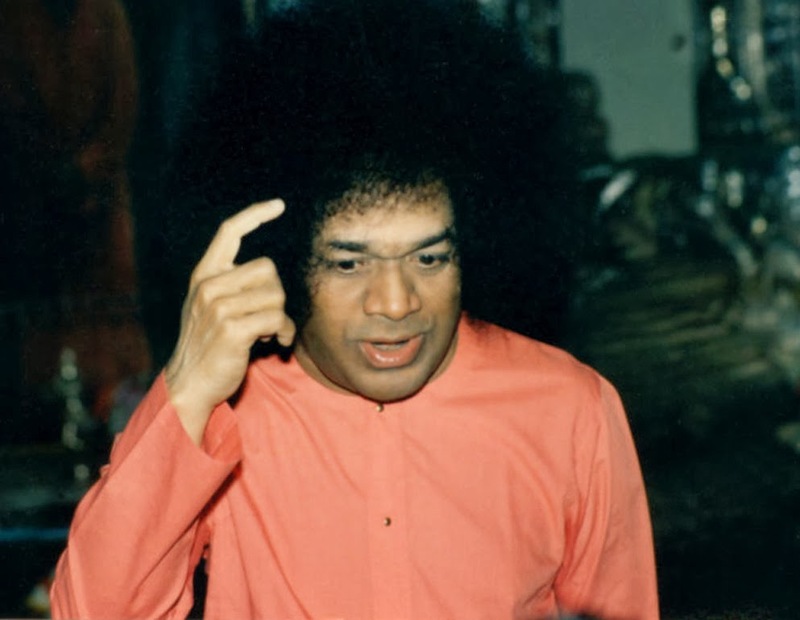 In Clip-2, Bhagawan explains how meditation, worship or chanting of the name of God are merely sacred tasks and cannot be equated to devotion. Devotion according to Bhagawan, is expression of gratitude to God. Clip-3 highlights how our entire life is like a limited company, wherein, every aspect needs to be within checks and boundaries. In Clip-4, Bhagawan advises us on the importance of discriminating between good and bad, between truth and untruth and accept only the good while rejecting the bad. Finally, Clip-5 stresses on the importance of determination, without which we cannot accomplish anything in our life. We must develop love that does not change. God’s Love never changes. We must make an effort to cultivate love for God who is truth and eternal. Several changes keep taking place in humanity. But in God, there is Love that never changes. Such true and eternal love for God is called Bhakti (devotion). There are certain desirable requisites for cultivating this love. The first requisite is Dedication. Dedication means making an offering to the Lord. Ahamkaara (ego) is the obstacle in man that comes between him and his love for God. Therefore, primarily, we must dedicate this ego to God. So long as we have this ego, we can never experience Divinity. Thus, on the spiritual path, the first thing we ought to do is to dedicate our ego to God. Among all qualities in man, ego is most firm and powerful. It is on account of this ego that man is being ruined in so many ways. Ego arises on account of physical strength, mental prowess, wealth and power. Therefore, it is not correct to become egoistic basing on our body, intellect, education and wealth. All these are ephemeral. Today we may feel very powerful and strong, but in a few days our strength may diminish. Today, we may be very wealthy but gradually the wealth may diminish. We consider ourselves wealthy. But, who is truly a wealthy person? The one who owes no debt to anyone. Who is truly a youth? The one who is healthy is a youth. The one who is conscious of his own defects is a true man. We should not make that which is changing, as our basis. Hence, we must first dedicate our ego (to God). The second requisite is Devotion. What is devotion? Performing meditation, singing bhajans, chanting of God’s name, participating in singing His glory; these alone cannot be called Bhakti (devotion). All these are merely sacred acts. Devotion primarily means expression of gratitude. When anybody does some help to us, however small it may be, like someone giving us a towel or some coffee, we say “thanks”. Thus, we express our gratitude even for such small and trivial things in our life. Is not the air that we breathe given by God? Even by fixing any number of fans, can we get the breeze that we experience from nature (in the hills)? Even if we were to light powerful bulbs, can they match the light of the sun? It is God who gives us this brightness (sunshine). This air is also given by God. Take the water that we use; even if we have any number of pump sets, can they produce the water that a heavy downpour of rain can produce? Therefore, water, light, wind, sound, food, head; all these are given to us by God. All the essential items for our day to day life have been bestowed on us by God’s Grace. Is it not necessary for us to express our gratitude to such a God? Thus the inner significance of all the Sadhana (spiritual practices) that our ancient people and devotees performed was to express their gratitude to God; as this is the significant principle of Bhakti (devotion). To meditate on Him, to sing Bhajans, is itself an expression of gratitude. We offer our service to God in so many ways. All these acts of service are expressions of gratitude to God. Therefore Bhakti (devotion) is expression of gratitude to God. The third requisite is Discipline. What is discipline? The recognition of the truth that “I am born as a human being, and therefore I must find fulfillment in life by conducting myself as a human being”. That is, everything must be within certain limits. Discipline means observing limits in our conduct. Na Shreyo Niyamam Vinaa – there can be no welfare without discipline or regulation. When we cross the limits, we become victims of disease. A small example: what is the ideal temperature in our human body? It is 98.4 (degrees Fahrenheit). But if it crosses the limit and becomes 99 degrees, we develop fever. The normal blood pressure in our body is 120/80 (mmHg). But if this pressure increases gradually, it results in disease of the heart. Every aspect in the human body operates within limits. The vision of our eyes also operates within limits. If exposed to extreme brightness, the retina gets burnt. The ear drums also can hear only limited sound. If subject to excessive sound, the drums will burst. Thus, our human life is like a limited company. We need to govern our life by observing these limits. Discipline includes aspects such as, the manner in which we need to move around in the market, the manner in which we need to move around in the Mandir, the way in which we need to interact with our elders. We need to learn respect and humility. Thus, as human beings, we need to observe our limits. We must not live like beasts and animals. We must lead our life with respect and dignity. During prayers we must be silent. When we go to a church; we must nurture a sacred heart. But again, discipline is not just these. It also pertains to the dress we wear, the food we eat, the sights we see, the words we speak, our conduct and behavior; all these must be related to spirituality. As a human being, our dress should be decent and we must maintain our dignity. The words that we speak must also be dignified. Our conduct should also be respectful. Therefore, all these are matters related to discipline. The fourth requisite is Discrimination. In every object and in every individual, good and bad; truth and untruth remain blended together. As they are all mixed up together, we must receive only the good and reject the bad. Let us say, we take a banana. We eat only the inner fruit and we throw away the outer peel. In the same way, with respect to our thoughts also, we need to discriminate, what is good and what is bad, what is right and what is wrong; and we need to accept the good only. Discrimination is not limited to worldly objects only; we need to discriminate even in our sight / vision, in our words, in our listening, in our looks, in our thoughts and in our actions. Only then the word ‘discrimination’ will acquire significance. Therefore, we must listen to good things, we must see good things, we must speak good things, we must think about good things and we must perform good actions. We need to enquire correctly as to what is good and what is bad. Let us say we feel hungry and so we go out (for dining). Without using our discrimination, we may buy some fruits and eat them. There may be so many insects (organisms) on the fruits. Not only that, we may go to some other place and consume food. There may be so many defects in that food. We must not be reckless in what we eat and drink, as this will affect our health negatively. Our mind also starts wavering. Therefore, take some time and enquire into the matter. Only then, can we attain mental and physical health. Thus, discrimination is very essential. The fifth requisite is Determination. Determination means a type of resolution. We must have the confidence that “I will be able to accomplish this, I must achieve this, I must reach the goal”. If we do not have such determination, we will not be able to achieve anything in life. We have embarked on our spiritual journey; now whatever obstacles may come, whatever difficulties may come, whatever others may speak about us, we must tell ourselves “No, this is my principle, I must accomplish this”. Without such a resolve, we can achieve nothing. It would be as though, we just come, see and go away; like passing clouds. If this is the case, we would not be able to achieve anything in life. Whatever strikes to you as right, whatever you consider as sacred, whatever you believe is truth, you must never leave that and you must make every effort to achieve that some day. That is real Tapas (penance). Tapas does not mean abandoning your house and going to the forest and sitting in contemplation with a closed nose. Whatever you have held on to, you must accomplish. Whatever you have desired, you must achieve. Until then, we must not allow our mind to waver. Determination means to have a Chalinchani manasu (unwavering mind) and Brahminchani drushti (a vision free from delusion). 01-What is it that we need to dedicate to God? Why? 02-What are the types of ego that arise in human beings? 03-Who is truly a wealthy person? 04-Who is truly a youth? 05-Who is truly a human being? 06- What is true devotion to God? 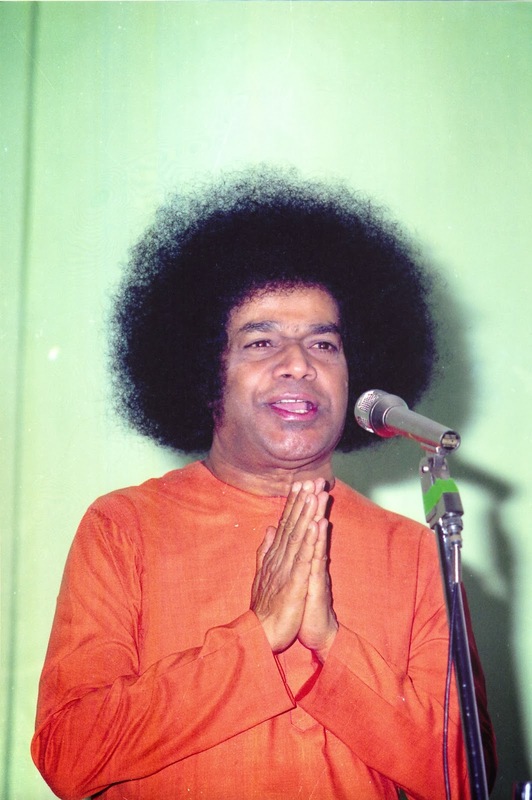 07- What are the examples that Bhagawan gives us, to illustrate the need for expressing our gratitude to God? 08-How can we express our gratitude to God? 09-Why does Bhagawan refer to our human body as a limited company? What are the examples He gives to illustrate the same? 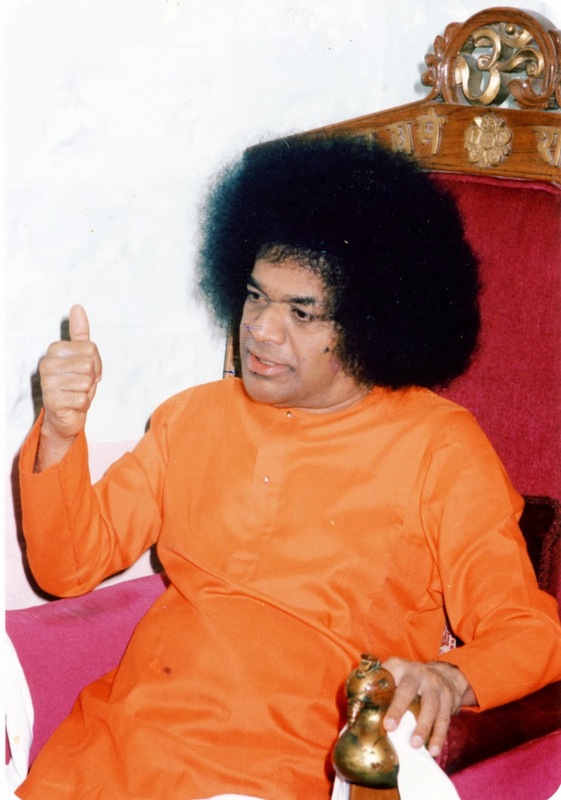 10-What are the various aspects pertaining to discipline that Bhagawan highlights for our benefit? 11-In what matters do we need to exercise discrimination? What are the examples given by Bhagawan to illustrate the same? 12-What is true Tapas (penance)?